Winter is coming in a little less than a month and here in Alberta, we’ve already experienced a few snowfalls and freezing weather. Plus icy roads. Slipping on the way to the mailbox is never fun. Ouch. Also, I know it’s too cold when my dog, Teddy, takes a look out the front door, backs away, and heads straight to the nearest blanket to nap instead of wanting to go for a walk. He loves the snow, but not the chilliness. Teddy: I'll take a nap instead. 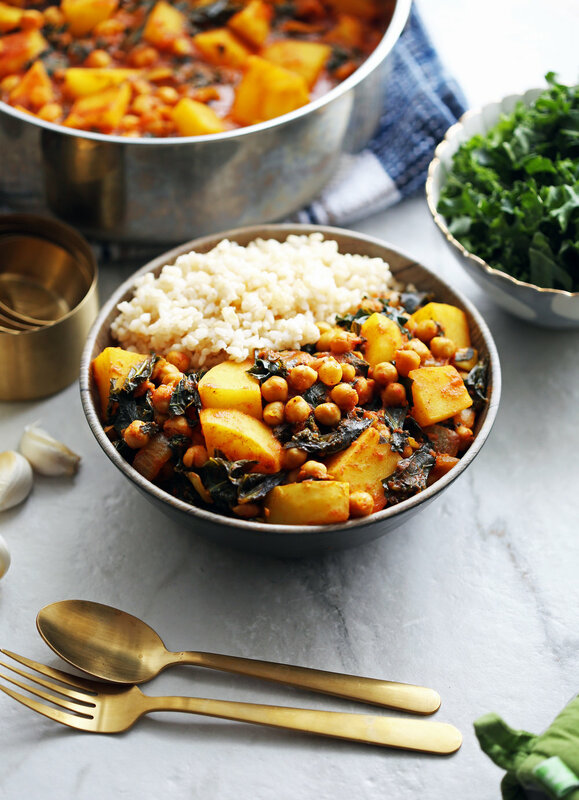 Hearty and delicious: Filled with chunky tender potatoes, small chewy chickpeas, and leafy tender kale all in a simple tomato curry. Very flavourful: It has a nice warming spiciness it (a mild-medium heat) using a variety of spices that have bold yet complimentary flavours. It is easy to up the spiciness if you prefer a lot more heat too. It’s healthy: It's full of vitamins and nutrients! For instance, kale is an excellent source of vitamin A and K, iron, and fiber. I love kale, but if it’s not for you, you can also substitute with spinach. It’s simple to make: A little chopping, measuring, and stirring. Everything is basically cooked in one-pot: With the exception of using a blender to puree the whole tomatoes, everything is then cooked in one-pot. Yay for less dishes to clean-up! It takes about 40 minutes to make: Half of the time is letting the flavours combine when it’s simmering on the stovetop. Vegan and gluten-free: If you have these dietary restrictions, this is a great recipe to try. All the ingredients in this recipe. Ingredient amounts and full instructions are listed below. The spice blend: turmeric, cumin, coriander, cinnamon, cayenne pepper, and black pepper. It gives this curry a nice mild to medium heat. Add more if you like it really spicy! Small round chickpeas, chunky potatoes, and leafy tender kale absorbs the flavours of the tomato-based curry! So scumptious and heartwarming. I have to admit that I was a little nervous making this for Scott as he is not the biggest fan of whole tomatoes, but what he loves is spice and this recipe has now shortage of that. Having been pureed, the tomatoes are more of a base and the spices provide a robust flavour profile. In the end, Scott enjoyed this recipe especially given how wholesome and filling it is. I hope you enjoy this recipe! If you make it, please let me know what you think by commenting below or through any of my social media! In a small bowl, combine the spices (minus the salt) and set aside* (see first note). In a blender, puree the whole tomatoes (with juice) and set aside. The pureed tomatoes will be around 4 cups** (see second note). In a large saucepan, heat the oil over medium-high heat and add onions with a small pinch of salt. Stir occasionally until onions are browned, 5-6 minutes. Add in the garlic and ginger and stir to combine with the onions for 15 seconds (do not allow the garlic to burn). Then stir in the spice blend until fragrant, about 30 seconds. Mix in the pureed tomatoes, chickpeas, and potatoes, making sure to scrape the bottom of the pan to get the brown bits. Stir in ½ - ¾ cup of water (or coconut milk) if necessary (enough to just cover the top of the chunky ingredients). Bring the mixture to boil and then cover and simmer for 15 minutes. Next, stir in the kale and cover for another 5 minutes, until the kale is tender*** (see third note). Taste for additional salt. Serve immediately with rice. *This spice blend results in a mild-medium heat in the curry. Increase the amount of spices for a more spicier flavour. **If you prefer not to puree the whole tomatoes, you can substitute with diced or crushed tomatoes. The resulting curry will be thicker. ***If you prefer a thicker sauce, remove half a cup of liquid and stir in 1 tablespoon of cornstarch until it is completely dissolved. Stir the cornstarch and liquid mixture back into the curry at medium heat until it thickens. Nutritional calories represent one serving (excluding rice) with eight servings total.